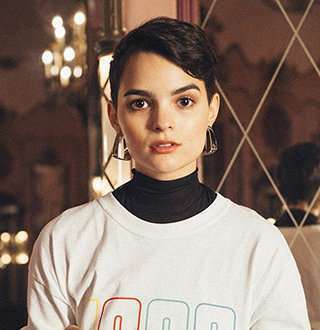 For young Hollywood stars who like to remain confined about their sexuality, the American actor Brianna Hildebrand had unusually come out openly as gay and even divulged her dating requirements. Not only that, she moved in with someone special! The Texas-native is an actress best known for her role in the web series Annie Undocumented, but her fame significantly amplified after being cast alongside Ryan Reynolds in the 2016's Marvel movie Deadpool. Apart from movies, she is also actively involved in social works. She has supported the Its Gets Better project, which aims to encourage LGBT youth all over the world. In her most recent movie, Deadpool 2, as well as its prequel, she portrayed a gay/lesbian character as well. In the first movie, she was introduced as a gay character wheras, in the second, her character got herself a lesbian girlfriend. Brianna Caitlin Hildebrand, who was born on 14 August 1996, is a daughter of Veronica and Caleb Hildebrand. The Texas-born actress had a big crush on Ryan Reynolds while she was in school. Brianna, who has a height of 5 feet 3 inch, had significant support from her family to pursue her acting career. She initially wanted to become a musician; however, she landed in the acting realm. Her first significant debut was in 2014 from the web series Annie Undocumented. Later in 2015, she made her first theatrical film appearance as Julia in the drama, Prism. She rocketed to fame in 2016 after she was cast alongside her childhood crush Ryan Reynolds in Marvel film Deadpool as the superhero Negasonic Teenage Warhead. After Deadpool, she was also cast in the 2016 film the First Girl I Loved. The young actress also became the member of the main cast of the second season of the horror drama series, The Exorcist. On 18 May 2018, she featured in the sequel, Deadpool 2. Reynolds‘ support played a huge part in delivering one of the Marvel universe’s first openly gay character. Not only that, he also encouraged Hildebrand into easing off the pressure: Ryan asked Hildebrand's blessing to sign off on the fact that her character spent so much time with her new girlfriend. Brianna duly obliged. In both the Deadpool series, she portrayed the mutant hero Negasonic Teenage Warhead. Brianna Hildebrand Comes Out As Lesbian; Now! Although strange for a young Hollywood actor, Brianna has come out openly as gay and even has a girlfriend. In 2016, she just casually started talking about her being a lesbian as well as having a girlfriend on her Twitter. On 10 February 2016, she tweeted stating that her girlfriend tweeted for the first time since she shared her Peanuts Movie character in September last year and added she was proud of her. "When I was little we went to Hawaii & I made my parents call me Jamie. If that wasn't the moment my parents knew I was gay idk what was." However, in an Interview with Vanity Fair in April 2018, Brianna revealed that she previously opened up about her sexuality as bisexual and then gay, but now she doesn’t describe herself anymore. Even after having a girlfriend, today she says that she doesn’t have a right definition of her sexuality. As of 2018, Hildebrand has moved in with her girlfriend, set decorator Jonneke Grisham. Brianna started dating her lesbian girlfriend, Jonneke Grisham in 2016 after she met her on the set of First Girl I Loved, in which she was cast in the role of lesbian and Jonneke was working in the art department of the movie as a set dresser. Towards the end of 2016, some publications suspected that the couple had ended their relationship; however, the speculation proved to be wrong as they are still together and often flaunt their love on the social media. Back in November 2017, her girlfriend shared a picture of them enjoying in a swimming pool of her house on her Instagram. She mentioned that she was thankful to have her back home. Moreover, in April 2018, Brianna spent an enjoyable fun time with her girlfriend in Indio, California. She even shared some of the pictures with her love on her Instagram account.